I want to share with you a card I made this evening. 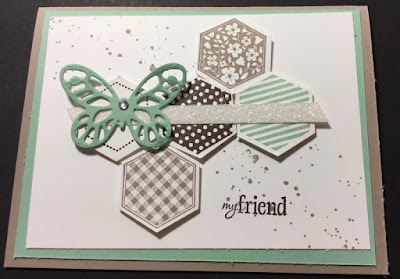 I found a card similar in the Stampin' Up! Catalog on page 105, and have seen many variations of it out in blog land. One in particular was at Julie's blog. I wanted to give it a try myself. 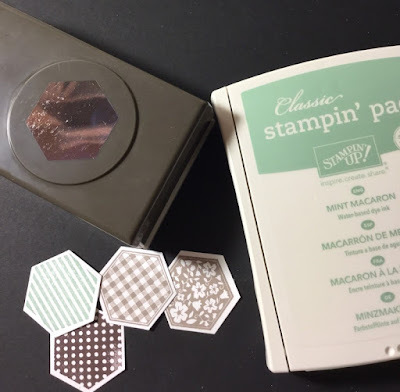 I love the fact that many rubber stamps with Stampin' Up have coordinating paper punches that will easily punch the stamped image out. It's not only convenient, but it's also very fun! Everyone purchases a minimum of $25 by the 15th of each month using a unique hostess code provided by me. When it is your host month, all the credit will go towards your party. This is a good time to get your friends and family to purchase as well so your party totals more and you receive more Stampin' Rewards! I will send you a catalog where you can shop for your items, and keep you informed of any seasonal or promotional events. I will also send you tips, demos and fun projects to keep your ideas fresh. Please email me if you want to participate and as soon as I have 6 club members committed, I will contact you with the details.